We first meet Jenny Calendar, the computer science teacher, in I Robot, You Jane. She and some of her students, including Xander, Buffy, Willow, Fritz, and Dave, are scanning books into the library's new computer system. This marks the first time that we see tension between her and Giles. He makes it clear that he's against computers, and she ends up calling him snobby and outdated since he prefers books to computers. This episode marks Jenny's first forays into helping Buffy and Co. Because Giles is unfamiliar with computers, Buffy suggests he ask Miss Calendar for assistance in casting Moloch out of the internet. She agrees, and it's in this episode that we learn she's a technopagan -- she states that the realm of the divine exists within cyberspace as well, and even though she's not a witch, she knows a little about the occult. At the end of this episode, we can tell that she and Giles are intrigued with each other somewhat. "Welcome to my world. You scared?" -- to Giles, when he enters the computer lab to return an earring to her. Ms. Calendar appears again in the last episode of Season 1, Prophecy Girl. She's come to tell Giles that she's gathered some information from the internet that points to the end of the world. She bugs Giles to tell her what's going on, but he says he'll explain later, and asks her to get some more information. This episode supposedly marks the first time that Ms. Calendar learns of Buffy's identity -- see Season 2's Surprise --. This is the episode where Xander and Willow want to know "How come she's in the club?" when they see that she knows of Buffy's identity. Ms. Calendar helps the gang fight off the Master's army of vampires, and holds Willow back from being attacked by the Hellmouth, which has opened. "The part that gets me, though, is where Buffy's the Vampire Slayer...She's so little." -- to Giles, after learning of Buffy's identity. Jenny appears in WSWB because she's vital to the plot of the episode in that since The Anointed One is trying to resurrect the Master, he needs to assemble all those who were close to him when he died. Ms. Calendar was in the library, near him, so she needs to be present for this ritual to take place. That's about all she's there for. SAR marks the first time that Giles and Jenny go out on a date. She beats Giles to the punch and asks him to the football game. Then when that date goes poorly, she makes it known she'd still like to go out with him. It's fun to see that Jenny is a character who'll speak her mind and can take control of a situation. School Hard continues the relationship between Giles & Jenny somewhat. What's interesting to note is that when Giles decides he must leave the safety of the library to go help fight the vampires who are attacking, Jenny worries for his safety but doesn't ask him not to go. I consider this foreshadowing for some later episodes because it's clear that Jenny realizes that responsibility must sometimes take precedence over personal feelings. At the end of this episode, she also clearly tells Giles that she knows what his responsibilites mean to him, but she'd still like to forge a relationship with him. Lie to Me has Jenny and Giles going out on a date -- she's asked him to go to a Monster Truck rally, and the date ends when Buffy calls Giles to tell him about a vampire attack on the school grounds. Jenny doesn't serve much of a purpose in this episode, but it does provide the segue needed for the next episode. A few episodes later, in Ted, Giles goes to speak with Jenny in the computer lab. She tells him that she's still a little freaked out, and she can't handle seeing him hurt, but she's not ready to get back together with him. This changes, however, when she reconsiders her words to him, and seeks him out at the park where he's gone to fight some vampires. When he's attacked by a vampire, it's Jenny who wields the crossbow and ultimately saves his life. This episode marks their reconciliation and the new beginning of their relationship. Part 2, Innocence is the first time that Buffy and Giles learn of Ms. Calendar's true identity. Jenny tells Buffy and Giles how Angel lost his soul, causing both of them to feel betrayed by her. As a result, they shut her out completely. Although Jenny didn't know what would happen to Angel if he achieved a moment of happiness (that is, she didn't know he'd lose his soul), she feels guilty for not coming clean about her identity, but it's too late. Also in this episode, since Jenny is the first to know that Angel's changed, she's able to save Willow from him...she tells Willow to walk away from Angel, and then Xander takes Jenny's cross and saves Willow. This episode marks the beginning of the end for Miss Calendar. "People are going to die." -- Jenny to her uncle, upon learning that there's no way to restore Angel's soul. Bewitched, Bothered & Bewildered features a lighter, comedic look at Jenny. She tries to reconcile with Giles, but since she's fallen under the spell that Amy cast for Xander, we just see her as a woman whose hormones get the better of her. 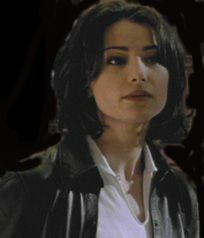 She makes a play for Xander in the library, and is part of the crowd that tries to attack him in Buffy's basement. Jenny's last episode, Passion is one of the most disturbing episodes of the entire series. She's still trying to reconcile with Giles, is still being snubbed by Buffy & Co., and yet continues to try to make amends. She goes to the local boogedy-boogedy store to buy an Orb of Thessala in which she hopes to restore Angel's soul. She's been working on translating the spell, though she doesn't really tell anyone of this since she doesn't want to get their hopes up. Buffy later approaches Ms. Calendar and tells her that Giles is miserable without her, and she says that Ms. Calendar should go reconcile with him. She's still upset with Ms. Calendar, though, and doesn't make peace with her herself. Later, Giles comes by the computer lab while Jenny's working, and they agree to meet later at his house, so he leaves. While Jenny's printing out the finished translation, she sees Angel is in the lab with her. She's frightened and tells him that she can restore his soul. He doesn't want that though, and destroys the Orb and the translation. Thus begins the chase in the school..Angel catches up to Jenny, and breaks her neck. The next time we see Jenny is when Giles returns home...he sees her lying in an impossible position on his bed, and realizes that she's been killed by Angel. The only thing left of Ms. Calendar's legacy is the computer disk which has a saved translation of Angel's cure. Unfortunately, it's fallen between the cracks of her desk, and no one knows of its existence. Yet. This episode was particularly horrifying because, although at first I didn't like Ms. Calendar, her character grew on me. And the way in which she was killed, and by whom, is not something that was easily witnessed. Jenny's mentioned in episodes following her death, but it's in I Only Have Eyes For You that it's most important. Giles believes that Jenny could be the ghost spirit that's haunting the school, and he goes off by himself to research it. The rest of the gang knows otherwise, and it's Willow who finally tells Giles that "Jenny could never be this mean." If her ghost ever does show up, that would be freaky. But this is Sunnydale, so who knows. Jenny appears briefly in Becoming part II. When Drusilla tries to get information from Giles, she tells him to see her with his heart. So basically Giles thinks he's seeing and hearing Jenny, and he gives the information. When Jenny goes to kiss Giles, Giles soon finds out that he's not seeing Jenny at all....he's seeing Drusilla. In Amends, Jenny's face is once again used as the vessel for evil. This time, she's plaguing Angel, telling him that his destiny is to destroy the Slayer, and that he can't escape his evil demons because basically that's who he is. She also tells him that even when he was mortal he wasn't good for much. In this episode, Jenny first appears to Angel when he's gone to see Giles. Jenny is hovering around Giles, but only Angel can see her. It's freaky. The last time she's seen in this episode, it's by Buffy, who's gone down to rid the town of the latest evil scourge. It's here that Jenny appears and tells Buffy about The First, basically the oldest evils in existence. Huge evil. Way evil. Then she shifts form into some black looking cloud of..evil? And that's it. Yeesh. Poor woman can't even just rest in peace without being conjured up by demons all the time. Yeesh. 2nd pic courtesy of Cynthia, Star-Crossed Lovers.